I found this out through one of my favorite Twilight sites and donated. I recently lost a Uncle a week ago due to cancer. I promised Laura whom is fund raising that I would put this on the blog to share with our readers. This fund raiser is for The Leukemia and Lymphoma Society (blood cancers). Please donate to fight a disease that has many forms. 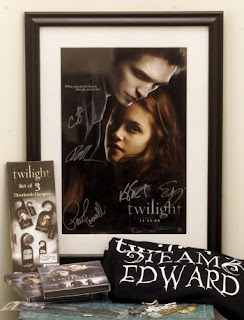 Even better is that you help and get to enter yourself in a raffle if you’d like for some Twilight merchandise. Author Jo Leigh (aka Jolie Kramer) lost her husband on June 13 after he courageously battled cancer. If you would like to help, please click on the image above! I know I will be checking it out myself to see what I can do. The greatest gift of all is giving to those in need! How many times have we heard no funding available for schools? I am sure with today’s economy that we hear it all the time. When back to school was in session and parents were trying to buy for their kids, it was all over the news. Parents struggling to find items for their children. Parents had to shop/search for bargains in order for their child to progress at school. I found this ridiculous. I know growing up myself there was not enough funding in my high school’s art department and yet it was the department that I thought understood me better than any other class I took. Unfortunately, the school is still in the same situation. So I ask all the fellow writer’s looking at this blog, take a look at this great website DonorsChoose.org. It’s a website whose mission is to help people across the nation fund their projects. Projects range from helping build libraries for young children to getting new technology to teach young adults. The great thing about this site is you can search by state or your interests! Also know that your donation is tax deductible and you are doing good for your country. No donation too small. Helping others is good for the soul.